Most volcanic activity in Yellowstone would not qualify as "super eruptions," in which 1,000 km3 or more material is ejected from a volcano. Lowenstern told io9 that supervolcanoes are "very large, single eruptions" that usually last for about a week. But, unlike what you'll see in certain television specials and Hollywood films, even a super eruption at Yellowstone wouldn't endanger the whole United States. It also wouldn't cause the kind catastrophe you might expect. 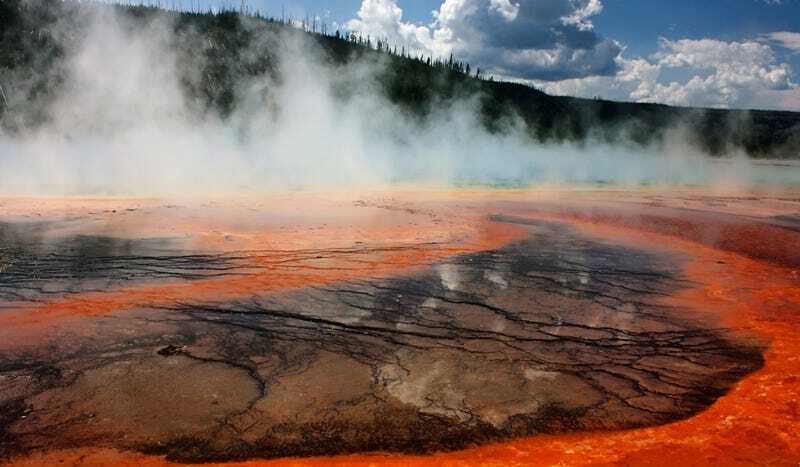 A super eruption might come fast and the Yellowstone magma source is enormous. But don't expect walls of lava pouring across the continent. Lava flows would be likely be "within the vicinity of the park," Lowenstern said, limited to a 30-40 mile radius. When a volcano erupts, he added, at least a third of the liquid rock that's ejected falls right back into the volcano's maw. The rest lands nearby, or goes up into the atmosphere. Most of the real damage comes from ejecta that's airborne. But it's not fiery death from above. Instead, most damage would come from "cold ash" and pumice borne on the wind. Lowenstern and his colleagues consider it "disastrous" when enough ash rains down that it creates a layer of 10 or more centimeters on the ground — and that would happen in a radius of about 500 miles or so. This ash might reach so far that you'd see a fine dusting of it on your car in New York. Air traffic would be grounded, of course, as we saw after the 2010 eruption in Iceland. But mostly this ash would pollute farms in the midwest, as well as the Mississippi River. In a sense, it would be like an industrial accident, clogging waterways and agricultural areas with toxic sludge. The worst outcome of this event would be the destruction of our food supplies and waterways. A super eruption, like all volcanic eruptions, begins with an earthquake. "A lot of earthquakes have to occur to break the rocks and allow magma to get to the surface," Lowenstern said, adding that we'd need some big ones in the weeks or months leading up to the eruption. That means there would be many warning signs before it happened — this eruption wouldn't come out of nowhere. Next, enormous vents or fissures in the Earth would break open near the caldera, perhaps in a ring around it or maybe as far as 10 kilometers away. Lava and superheated gasses would shoot out of these vents very rapidly, draining the magma reservoir beneath the caldera. As the the magma quickly drained, the caldera would begin to crumble. Eventually, it would collapse in an oval-shaped sinkhole that might be roughly 50 miles long by 30 miles wide. After the vents released their gasses and the ground collapsed, it's likely that we'd see a global effect on temperatures. "Any big eruption causes a cooling of the atmoshpere, especially especially with that much ash," said Lowenstern. In 1812, the Mount Tambora super volcano eruption in Indonesia lowered global temperatures. A caldera-forming eruption in Yellowstone would be bigger than the one in Tambora, so climate change would almost certainly follow. The cooling, however, would only last for a few years. Lowenstern said there's no reason to expect that we'll have an eruption of this size any time soon, especially because the caldera has gone through many regular eruptions that release pressure. "It may be done, or it may move on to another area," he said. "In a couple million years, [the volcano] might start in the northeast." As continental plates shift, so too do volcanoes — so the Yellowstone supervolcano might not go off until it's far beyond the area we call Yellowstone today. "A more likely eruption is going to be a lava flow, a small event," Lowenstern said. Are there signs of an impending eruption? Currently, the Yellowstone caldera shows no signs of preparing for a super eruption. That doesn't mean that there aren't regular earthquakes in the area — that's just a natural part of being in a volcanic region. And the caldera itself rises and falls all the time, the ground moving up and down as pressure increases and decreases in the magma reservoir below. "It rose about 27 centimeters max over the past 6 years," Lowenstern said. "Calderas are big and hot, so they don't break very easily and they just move up and down. It's the way heat and gas get out of these deep systems — the system breathes." He added that if a super eruption were coming, "you'd need extraordinary activity," something that went way beyond centimeters of movement and a few small quakes. Right now, the Yellowstone caldera is breathing normally, exhibiting behaviors typical of any massive hydrothermal system. Lowenstern and the team of scientists at the Yellowstone Volcano Observatory are constantly studying the caldera, looking for changes and working on projections of what the next eruption might be like. An eruption could "come at any time," Lowenstern admitted. But would it be a super eruption? Probably not. And even if it were, the damage wouldn't be the inferno you might be expecting. Instead of fleeing from hell on Earth, you'd just be slogging through lots and lots of ash cleanup. If you want to know more about how supervolcanoes have affected the history of the planet, you can learn about that in my new book, Scatter, Adapt and Remember: How Humans Will Survive a Mass Extinction. Also, I'll be on book tour! You can see me in San Francisco, Boston, Los Angeles and Berkeley. Click here for dates and places!